So, you could imagine my excitement when I saw the Titans were traveling to London for a game. 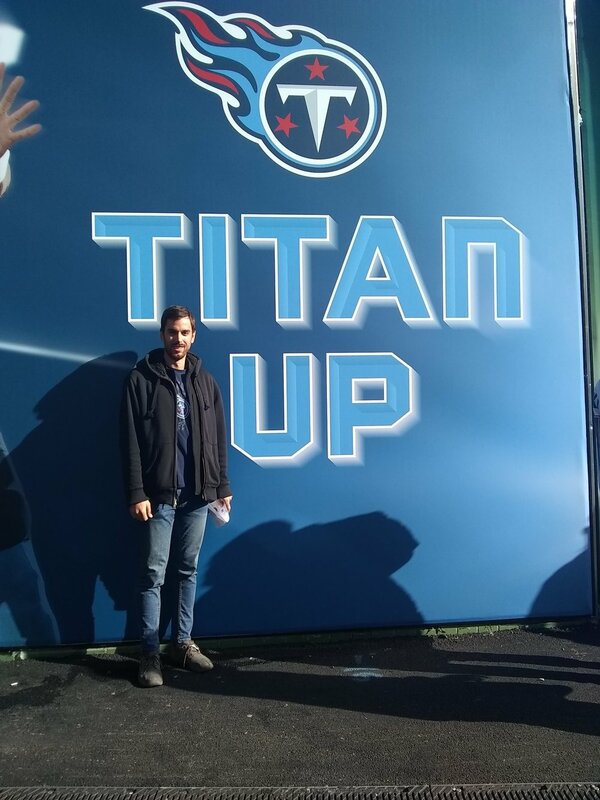 I’ve been a Titans fan ever since they moved the team to Nashville in 1999 and thought this may be a once in a lifetime opportunity. It was only a two-hour flight away and the ticket price wasn’t outrageous, so I got everything ready and took off. As I made my way to Wembley Stadium, I was surprised to see how many NFL fans there seemed to be. I hardly saw any Chargers or Titans jerseys, but I think I saw all 32 NFL teams while I was there. I saw a Kellen Winslow Jr. Browns jersey, a Clinton Portis Redskins jersey, and way too many Blake Bortles jerseys. The people wearing those jerseys were from all over too: Germans, Scots, Welsh, Dutch, English (of course), and even some Spanish folks made their way to the game. It was pretty cool to see how the NFL is more global than I believe a lot of people realize. On the tube, there were tons of people discussing their fantasy teams, making last minute adjustments and complaining about injured players. It felt like I was back home, heading towards a Titans game with my friends. But instead of hearing, “he’s a great player” it was often “what a good lad he is” or “good ball last week”. Entering the stadium was relatively easy, Wembley incorporated the same security standards for all stateside NFL games (no bags, only clear purses, etc.) but after getting through the long line, I was in. The stadium itself was absolutely packed, almost 85,000 people came out to watch American football. I was curious though: were all these people here for entertainment or the sport itself? It’s like whenever I go to a hockey game, I know nothing about hockey but it’s fun to go to in person. The answer: 80% were there for the game and the other 20% were there for entertainment, if that makes sense. It was a weird atmosphere too, because while it was technically a Chargers’ home game, they still played Titans’ promotional videos and images. Everyone in the stadium got a Chargers flag to wave around, which definitely turned it into a home game for them (I threw my flag on the ground and periodically stepped on it). They brought the Chargers’ cheerleaders, drumline, and some guy who plays a trumpet at Chargers games. I was pleasantly surprised that everyone around me knew the rules and big players. Everyone was familiar with the penalties and flow of the game (although I did hear many questions about what a clipping penalty was). There were still moments where people who scream out “wow, look at that!” on a regular hit or play or be confused at a routine substitution, but it was probably the first time anyone had been at a live game. I don’t think anyone there was a big X’s and O’s guru but, then again, neither am I.
I won’t get into the game itself because it makes me angry and you can look at other places for a game summary. After the game ended, I talked with the group of Welsh guys who were sitting next to me and I asked them how they got interested in the NFL. They told me that a few years ago, they all just got really tired of soccer and wanted to something new. About that same time is when the NFL started playing more games in London and put a pre and post-game show on SkySports (their version of ESPN). They all picked a favorite team, started coming to the games, and really got into it. I don’t have any statistics to back it up, but they were telling me it’s exploded in popularity in the last five years because it's something new, different, and really enjoyable. They thought it will only continue to grow and more people will get into it. After seeing 85,000 people there, the atmosphere, and how well the majority of the people knew the game, I’d have to agree with him. A team in London may not work logistically but could it survive there? Absolutely.